This weekend I’m preparing to teach Dante’s Divine Comedy for the next five weeks to a group of tenth, eleventh, and twelfth grade students. The task feels overwhelming, especially when I consider the complexity and influence of his poem. Never mind introducing the Divine Comedy to a group of college/adult students, how do I distill the significance of Dante’s work for high school students without either misrepresenting the poem, making it impossibly tedious, or devoting the rest of the year to reading it? I ask a similar question of almost every text I teach–this year alone, we’ve read The Consolation of Philosophy, Pilgrim’s Progress, Saga of the Volsungs, A Connecticut Yankee in King Arthur’s Court, Murder in the Cathedral, etc. As far as I can tell, there is no easy or best answer. I can only hope to give students a sufficient introduction which will hopefully inspire them to return to the text later. This, after all, is only a first pass. This is the Aristotelian conception of telos. All things have an end, by which Aristotle meant that all things have an ideal function/purpose. The fulfillment of that purpose will inevitably bring happiness (Greek: eudaimonia). To have accurate knowledge of a thing, you must know its telos, which is unique to every individual person/thing. The punishments in the Inferno correspond to each soul’s direct violation of his telos. The skin diseases of the alchemist, for example, “express, in brute corporeal form, the reality of the falsehoods the alchemists committed” (Esolen xv). Hell, as C. S. Lewis pointed out in The Great Divorce, is locked from the inside. God does not stand over hell imposing punishments on the sinners. They punish themselves by refusing to turn toward the true end and fulfillment of all their desires. One of the most wonderful (or most tedious, depending on how you view it) is Dante’s belief that every minute detail plays into the overall importance of God’s created cosmos. Nothing is too small. Esolen illustrates the idea with Jesus’ reference to Jonah in the Gospel of Matthew. Of all the prophets Christ could have referenced–Isaiah, Ezekiel, Elijah, etc.–he chose one of the minor prophets as “a type, or forerunner” of Christ’s own death and resurrection. Jonah wasn’t merely a convenient symbol. He is a testament to the truth of salvation. It is possible to treat every aspect of Dante’s poem in the same way. Detailed descriptions of every punishment in Hell speak to the nature of the sin itself and of it’s corollary telos. This is true not only of the content of the poem but of its structure as well. and stole for you the short way up the hill. Will a discussion about these three principles be sufficient to excite my students about reading the Divine Comedy? Will it be enough to help them grasp some of the basic and essential thematic components of the narrative? Maybe. I probably won’t know until we’ve moved on to a new book, and I’m again busy asking the same questions. I met one half of my goal at the end of 2018 and finished Alasdair MacIntyre’s book After Virtue. There were points where I had to push my way through some of the dense philosophical analysis of other philosophers and allusions to some of the current academic debates that were relevant at the time he wrote the book. Much of that went over my head. Nevertheless, the thesis of the book and some of MacIntyre’s most important arguments came through loud and clear. This is due, in part, to MacIntyre’s repeated summary of his own argument and my prior familiarity with recent work by writers like Karen Swallow Prior, James K. A. Smith, Rod Dreher, and Patrick Deneen (et al.) who frequently reference some of his most important claims. The premise of MacIntyre’s argument is that the modern world of moral knowledge is in tatters and has produced a “simulacra of morality” in western culture (2). Although modern moral knowledge relies on the intellectual/philosophical capital of ancient civilizations, it purports to have disabused itself of ancient myopic prejudices. Despite the similar moral vocabulary, morality itself has been reduced to “use” and “preference.” MacIntyre describes the current accepted mode of moral philosophy as emotivism, an idea he locates primarily in the work of G. E. Moore whose book Principia Ethica was influential for the early 20th century writers known as the Bloomsbury Group. MacIntrye defines emotivism as “the doctrine that all judgments and more specifically all moral judgments are nothing but expressions of preference, expressions of attitude and feeling, insofar as they are moral or evaluative in character” (11-12). Sound familiar? Go check out Comment Magazine’s recent issue on minimalism where they address many of our current cultural obsessions with #lifestyle choices and self-actualization, and you’ll see what I mean. To demonstrate the precedence for Moore’s philosophy, MacIntyre walks backward through history. He shows how modern moral conceptions have been built on previous failures of philosophy to justify various moral behaviors. After Moore, he discusses Kierkegaard, then Kant, Diderot, Hume, Mills, and Bentham, among others. I can’t give a full evaluative account of his philosophical history on this point, but what little I have read of the philosophers he engages, his observations about the development of moral philosophical ideas ring true. The walk backwards through the history of moral philosophy changes directions at chapter nine. At this point, MacIntyre addresses the significance of Nietzsche who, he argues, was one of the few philosophers in the history of the modern west to fully grasp the hollowed-out moral vocabulary in the west. MacIntyre, however, is an Aristotelian and he uses Aristotle as Nietzsche’s character foil. The brilliance of Nietzsche’s “will to power” theory stems from his willingness to take seriously the logical outcomes of moral utilitarianism and emotivism, which MacIntyre identifies as the view that individuals are autonomous agents. During and after the 18th century, philosophers began to think of individuals atomistically–as discreet entities that can be understood apart from their social context. This shift marks a radical departure from historical forms of anthropology. Beginning with Homer, MacIntyre observes that most (if not all) ancient conceptions of man stem from a conception of the social order to which an individual belongs. Every human person has a social role, and this role tells us at least two important aspects about that person: 1) we learn her identity—i.e., who she is is predicated on her social membership and inherited cultural traditions; and 2) we learn her moral value—i.e., what she is owed and what she owes to others. According to MacIntyre, any recognizable and practical form of virtue is inextricably linked to the larger social order. Individuals cannot be virtuous on their own, much less have an identity apart from the social context in which they were born. To pretend that a person can wholly cast off the cultural traditions inherited by the time and place of her birth, and the context in which she grows up, is delusional at best, and at worst will usher a person off the cliff of existential despair (e.g., MacIntyre does not mince words about his disagreement with Jean Paul Sartre). Toward the end of the book, MacIntyre argues that the fragmentation of morality has corresponded with changing conceptions of the self—specifically the tendency to think atomistically of human identity and actions (204). In contrast, “moral arguments within the classical, Aristotelian tradition…involve…the concept of man understood as having an essential nature and an essential purpose or function” both of which are rooted in the larger social structure (58). More from MacIntyre: “It is only when man is thought of as an individual prior to and apart from his roles that man ceases to be a functional concept” (59). The atomistic thinking of the modern era has resulted in two fundamental problems. First, individuals have been stripped of any coherent identity. The “self,” abstracted from its social embeddedness, loses any narrative sense of its place and purpose. In some ways, the idea of an overarching narrative is at the root of MacIntyre’s solution to his diagnosis of modern western culture. Without a narrative—the inherited history, stories, modes of behavior, geographical location, traditions, etc.—people lose their conception of a telos. There is no end by which they can evaluate themselves, nor is there a clear functional purpose to their existence. It’s important to note as well that MacIntyre does not believe a person is the sole author of her own narrative. At best she is a co-author. Narratives are passed down from one generation to another. While it’s possible to reject certain aspects of a particular narrative, a person cannot completely reinvent or escape the givenness of their history and traditions. It’s at this point in MacIntyre’s argument that most critics begin to bristle. He starts to sound nostalgic for the good ol’ days of ancient Athens, when people knew their place, agreed upon a unifying “Good,” and behaved accordingly. Scott Alexander, for example, agrees with MacIntyre’s analysis of modern philosophy but finds a) his use of virtue ethics to be a non-solution solution because it requires a consensus about how to solve moral dilemmas, but such a consensus is impossible; and b) he thinks MacIntyre’s version of history is overly simplistic. Responding to Scott Alexander’s distaste for virtue ethics would require a whole new post—and I’d need to do more homework on the subject. But his critique of MacIntyre’s history is much less substantial if you pay attention to MacIntyre’s own critique of Aristotle’s view of history. Aristotle did not understand the transience of the polis because he did not have an understanding of historicity. Both Plato and Aristotle took the long-term staying power of the polis for granted, and failed to recognize that no city will last forever. Cities—and specifically social orders—rise and fall and reappear in new iterations. Sometimes the fall of a particular polis is good and sometimes a new iteration successfully corrects the errors of the previous one. But sometimes they don’t. MacIntyre is not nostalgic for an ancient Athenian polis. However, he recognizes that Aristotle’s insistence that virtue is connected to a social order, and that successful social orders require a shared understanding of the “Good,” is not wrong. Unfortunately, the modern era’s hyper awareness of historicity has caused many of its most influential moral philosophers to advance an extreme and untenable view of moral knowledge. Hence, “unmasking/demystifying” history has become one of the highest and only true modern virtues (72). The result, however, is a culture that uses an inherited moral language with an unspoken emotivist understanding, hallowed out of meaning and deprived of any grounds for rational justification. 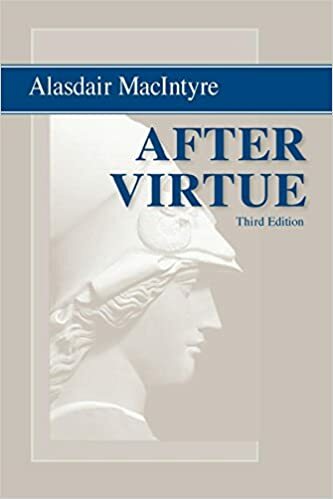 During and after reading After Virtue, I was struck by the thoroughness of MacIntyre’s argument which he roots in a series of interconnected close readings of philosophical, literary, and historical texts. All of which call for greater scrutiny, since each of those chapters could have been a book unto itself. In preparing this post, I toyed with the idea of only writing about his section on medieval narratives and his assertion of a fundamental historical shift from ancient heroic to medieval quest narratives and the role they played in reshaping anthropology. Any writer is in dangerous waters when he condenses and summarizes large, complex, and epochal social changes into a single book chapter. In fact, it would be worth taking each chapter on its own terms. But for a blog post that, I realized, would risk getting lost in the weeds and missing the big picture. From the beginning, I forced myself to read through large chunks of the text so that I could get a better sense of MacIntyre’s argument. I wanted the big picture, even if it came at the expense of all the details which are equally important and fascinating in their own right. I’m sure I’ll return to specific chapters in After Virtue. In the meantime, I’m glad to have had the discipline to read it all in one fell swoop. 1. Brad East has a fantastic article at Mere Orthodoxy that outlines the ways in which academic debates trickle down into mainstream discussions. Brad specifically addresses the Benedict Option phenomenon and its academic predecessors. He doesn’t solely focus on MacIntyre, but he figures heavily in his article. 2. Stanley Hauerwas is a philosopher and theologian who has not only been influenced by MacIntyre’s work, but has also become one of the great expositors of MacIntyre’s philosophy as it has developed across his various publications. Hauerwas wrote a great article for First Things several years ago that gave me a better sense of MacIntyre’s philosophical project, context, and development. 3. Dallas Willard also engaged MacIntyre’s work regularly. As far as I can tell, he believes MacIntyre’s project ultimately failed, but that it brought to light important, under-discussed dimensions of modern moral philosophy. I watched Willard’s UCI lectures, and hope eventually to read the corresponding book to get a better idea of where Willard disagrees with MacIntyre. I am attempting a difficult task. 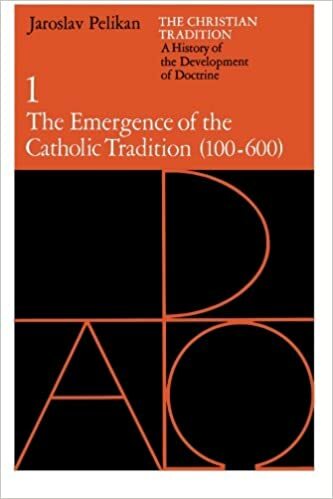 Before the end of the year, I hope to have finished reading Aladair MacIntyre’s book, After Virtue, and the first volume of Jaroslav Pelikan’s book The Emergence of the Catholic Tradition (100-600). I’m almost half way through MacIntyre’s book, and only in the second chapter of Pelikan’s. So, at the very least, I’m hopeful I’ll finish After Virtue and have made substantial progress in The Emergence of the Catholic Tradition. Tradition without history has homogenized all the stages of development into one statically defined truth; history without tradition has produced a historicism that relativized the development of Christian doctrine in such a way as to make the distinction between authentic growth and cancerous aberration seem completely arbitrary. . . The history of Christian doctrine is the most effective means available of exposing the artificial theories of continuity that have often assumed normative status in the churches, and at the same time it is an avenue into the authentic continuity of Christian believing, teaching, and confessing. Tradition is the living faith of the dead; traditionalism is the dead faith of the living. Pelikan’s series on the history of Christianity has been recommended to me countless times, and any time I run across reading lists of my favorite theologians, professors, and/or Christian writers in general, his name is inevitably near the top five. So far, he’s living up to the hype. His brief discussion about the difference between history and tradition is worth the price of admission. As someone who has gone through an English graduate program at a local state school, I can tell that very few academics who write about Christian beliefs and practices in history make the distinction he makes (…though in my experience it’s nearly zero). All of history is either an arbitrary series of events or worse a socially constructed narrative that reinforces contemporary power structures. In one sense, history is both of those things. But as far as the Christian church is concerned, history is more than a series of events and more than a cultural construction. It is a living tradition that preserves divine revelation, which breathes life into the contemporary church, and connects it with the past. Individuals do not have the power to tamper with tradition in the same way they can alter historical narratives for personal prestige or empowerment. Christians participate in the tradition; they don’t write it. The distinction, even as I’m writing about it, is difficult to parse. But Pelikan reminds us that there is a difference, and that we should apply our understanding of tradition and history to the study of the development of church doctrine–past, present, and future.